Welcome to The Priory, Normandie. In the 17th century this house was a Priory with a full complement of monks. The monks are no more but the house has been added to and improved throughout the centuries. The house has recently been sympathetically renovated with modern facilities, but the old-fashioned charm and many of original features remain. 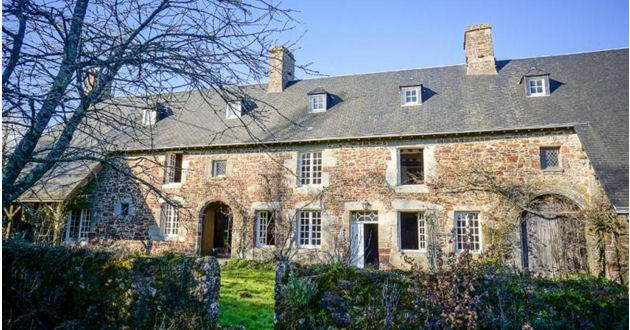 Now a self-catering holiday home (gîte), there are 6 large bedrooms, two lounges and two kitchens and a large library which is ideal for just sitting and reading or contemplating. There is French, English and German TV and of course, Wifi. The gardens surrounding the house provide secluded suntraps, a covered verandah (we do sometimes get rain in Normandie!) and a large area to the rear and side of the house for children to run around and play. There is parking for 3 or 4 cars. With central heating and two fireplaces (logs can be supplied), the house is available to rent all year round. The house is well situated in a very small hamlet just outside Gavray, with easy travel links for your days out. The beach at St Martin de Bréhal is just 20 minutes drive away, as is Coutances with its shops and cathedral. Villedieu-les-Poeles (again just 20 minutes away) offers a bell foundry, lace museum and copper factory tours. The nearby A84 offers easy access to routes north (Caen, home of William the Conqueror, and the Normandie landing beaches) and south to Rennes, St Malo and le Mont Saint Michel).